Last Friday several MIT Community members attended a candlelight vigil in memory of the victims of the Virginia Tech shootings. On April 16 Cho Seung-Hui killed 32 people before taking his own life in the deadliest campus shooting in U.S. history. 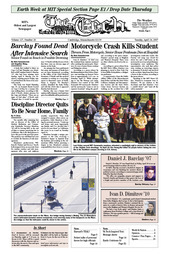 Ivan D. Dimitrov '10 died over the weekend from injuries sustained after crashing his motorcycle. Dimitrov, 20, was a Senior House resident and Bulgarian citizen. As you may have noticed, MIT is full of people who are highly committed to energy and sustainability issues, from President Susan Hockfield with the Energy Initiative to numerous student groups involved in almost every imaginable aspect of environmentally-conscious action and innovation. Add to that the professors who have made it their business to pursue research related to sustainability issues, and the Facilities staff who oversee MIT’s own energy use, and you begin to get an idea of just how unlikely it would be that we could cover all the worthwhile projects happening on campus. A body that washed to shore on Cape Cod last Thursday was identified as MIT student Daniel J. Barclay '07, who had been missing since Sunday, April 8. Barclay was declared a missing person Friday, Apr. 13 and had been the focus of an area-wide search. Ten months after assuming her role as director of the Office of Student Mediation and Community Standards, Veronica Mendoza '96 will be leaving MIT at the end of May to resume practicing law in California. She is the third person to leave this post in the past four years. The position was redefined last year to exclude the function of risk management.